Evgenia Medvedeva of Russia poses with her gold medal in the ladiesfree skating program during the Ladies medal ceremony at the 2015 ISUProgressive Skate America Grand Prix at the UMW Panther Arena inMilwaukee, Wisconsin, USA. 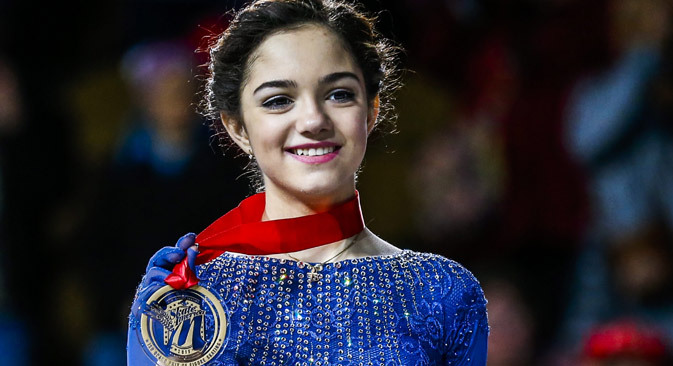 Russia’s 15-year-old junior world champion Evgenia Medvedeva won her first senior Grand Prix Series event at Skate America, which took place in the U.S. city of Milwaukee from Oct. 23-25. Medvedeva outscored American skater Gracie Gold on her own turf, staking a claim to the leading position in women's skating this season. But who is this new starlet? The future champion started figure skating when she was just three years old. While her mother had also been a figure skater, Medvedeva began practicing the sport not to continue the family dynasty but first and foremost to correct her figure. "My parents wanted me to figure skate not because my mother had been a skater, even though this also played a role, but because my figure was not so nice," Medvedeva told the Russian Figure Skating Federation press office. "Actually, my shoulder blades still stick out, but I think that appearance-wise figure skating has made me more attractive." "Once I saw Evgeni Plushenko perform and I wanted to skate like him," said Medvedeva. "I wasn't attracted to other sports." Immediately after the 2014 Olympics in Sochi, when the whole world fell in love with the girl with the red coat from the "Schindler's List" program, Medvedeva was asked what it was like to share the ice and a trainer with the Olympic champion. Despite her young age, Medvedeva responded tactfully and politely to the provocative question. It was Ilya Averbukh, successful choreographer, ice show producer and 2002 Winter Olympic silver medallist, who told this sensational story. "Lipnitskaya proposed this choreographic idea last year," the Komsomolskaya Pravda newspaper cites Averbukh as saying. "The program suited Yulia very much. We finished it pretty much ahead of time but Yulia's mother said that Yulia would not perform it. In the end it was decided to change the program… I'm happy that the program did not die. Thanks a lot to Evgenia for bringing it to life." "With her arm raised" Medvedeva can do the double axel (the jump during which she fell in the free program in Skate America), the lutz, the flip, and the rittberger. However, the figure skater does not include the rittberger jump in her program because it is not stable. Medvedeva has tried jumping with both arms lifted upward but feels more confident with raising only one arm. Also, the additional points that judges give for complicated elements make up part of the final score anyway. Medvedeva has her own view on the expansion of her jumps' technical potential, and has admitted on many occasions that the axel is not her jump. That is why she will not practice the axel with three and a half rotations, which only a few athletes perform, including world champion, Elizaveta Tuktamysheva. Medvedeva plans on perfecting her jumping skills with the difficult quadruple Salchow.